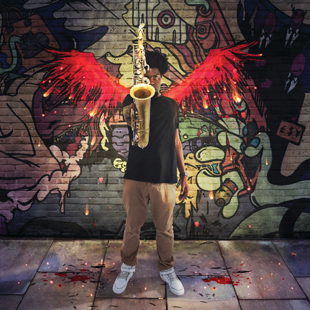 Award-winning jazz and hip hop star Soweto Kinch opens Birmingham Repertory Theatre’s newest auditorium, The STUDIO, with an incredible staged performance of his critically acclaimed album, The Legend of Mike Smith. Inspired by The Seven Deadly Sins and Dante’s Inferno, Soweto and a company of musicians, actors and dancers present the story of Mike Smith, a young, aspiring MC caught in a world of temptation where the boundaries of reality and fantasy collide. The modern fable follows a day in the life of Mike Smith, who gets a call from a record label talent scout telling him he could be the next big signing if he proves himself at an audition the following day. He falls asleep and dreams he’s on a battleground with injured soldiers and demons before chancing upon a golden microphone given to him by a group of sages. When he wakes up he’s ready to start work, but he’s beset by each one of the seven deadly sins. Smith is portrayed by a double narrator (a device, coincidently, also used in Kurt Weill’s Seven Deadly Sins). Smith’s inner thoughts are narrated by Soweto with the protagonist and other characters played by dancers and actors, Tyrone Issac Stuart and Ricardo Da Silva. The end result is an inventive narrative and absorbing combination of animation, dance and music that melds wide-ranging influences fromjazz and Bach chorales to hip hop and freestyling. An alto-saxophonist and MC, Soweto Kinch is one of the most exciting and versatile young musicians in both the British jazz and hip hop scnes. He has amassed an impressive list of accolades and awards on both sides of the Atlantic including a Mercury Music Prize nomination, two UMA Awards and a MOBO for Best Jazz Act in 2003 and 2007. The Legend of Mike Smith will be directed and choreographed by the pioneer of British hip hop culture and one of Soweto’s long-time collaborators, Jonzi D. Joining them will be musicians Shane Forbes (drums) and Nick Jurd (bass), visual artist Nat Jones and costume stylist Mimi Fresh. The Legend of Mike Smith will be the first show in Birmingham Repertory Theatre’s new auditorium The STUDIO. The theatre reopens to the public on September 3rd following its two-and-a-half-year closure for redevelopment.